Jon Watchuk was drawn to the way that AMSS is making a difference for motorcycle riders. He loves riding and hates to see anyone getting hurt by following their heart. 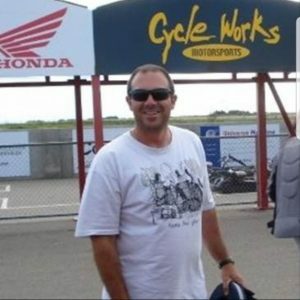 For over 25 years, Jon has been enjoyed riding so much that he has put on almost 300,000 kms! He can’t imagine not being able to swing his leg over the saddle and head out for some blacktop time. For four years running, Jon completed the Alberta 2000, which was one of North America’s premier motorcycle endurance rallies. He has owned 81 Yamaha DT175, 84 Yamaha Seca 400, 91 Suzuki Katana 600, and a 97 Yamaha YZF1000, of which he liked so much he has owned two! Jon heads up the Corporate Membership team and can help anyone out with any questions on how your business can support AMSS. For more info on Corporate Memberships, click here. For more information, email Jon at corpmember@ab-amss.org.